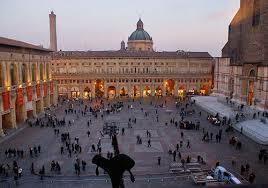 We were delighted to see that the famous British chef Rick Stein chose Bologna for one of his weekend breaks as it is one of our favourite Italian cities. Of course Marche has its share of beautiful small cities like Ascoli Piceno, Fermo, Macerata and Urbino, each with historic architecture, magnificent squares, fascinating galleries, world class opera etc., but none of them have that big city cosmopolitan buzz. Boasting Europe’s oldest university Bologna is a beautiful historic city and the still thriving student population ensures that it has a vibrant feel. 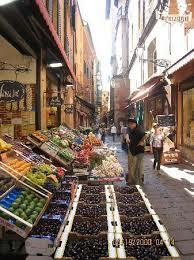 At weekends the city centre is closed to traffic accommodating street food, street entertainment and street art. The shops and markets prove that this is a city that loves its food, the freshest and finest ingredients are all beautifully displayed in the maze of narrow streets which make up the historic centre. Its nickname (one of many) may be Bologna the Fat but you cannot say that about the majority of the population, clearly in moderation top quality and fresh food make for stylish healthy living. A compact city centre makes a car more of a burden than a necessity, the centre is easily explored on foot and even on a rainy day there’s no fear of getting wet as it boasts over 40km of covered logge, arched covered walkways lining practically every street in the centre. Bologna’s airport is a short bus or taxi journey from the centre and is served by an excellent network of flights from all over Europe. Direct train services run to Paris, Switzerland, Austria and Germany – as well as all major Italian cities. Ancona, or Civitanova, both have car rental locations near the station making Bologna the ideal city adjunct to a relaxing Casal dei Fichi stay. Alternatively the drive into Marche follows the A14 all the way and couldn’t be simpler. Stay – Art Hotel Orologio just steps from the main Piazza Maggiore but much quieter than Stein’s choice with great breakfasts, beautiful décor, fantastic artwork and all on a theme of historic clocks. Eat – Il Rovescio. The evening walk to, and particularly back from this restaurant takes you along the buzzing Via del Pratello; Bologna’s often youthful, often beautiful, but always friendly population enjoying the lively bar and café scene. The food combines modern with traditional, homage to classic Emilio-Romana meat dishes alongside a great selection of veggie and vegan options. Eat More – Franco Rossi. If you want a more traditional experience you won’t beat this classic restaurant. When we stumbled across it we sat next to a couple who eat there every week and hosted their son’s wedding reception in the restaurant. ‘nough said!